It was a bit of work, but I got it. Octoprint running on the pocket beagle. Excuse my ignorance but - what is a Pocket Beagle? 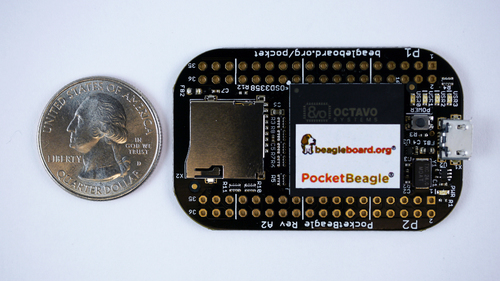 Tiny Beagleboard? The pocket beagle is a shrunk version of the beagle bone black. It is designed to fit in the smaller Altoids tin. A company called Octavo Systems makes a System in Package that contains the vast majority of the parts needed to build a beagle bone black onto one unit, to simplify design and production. It lines up with the Rpi Zero, but no on board WIFI (or ethernet). Its about the same size too. Right, so the reason I posted this was a prelude to performance questions. 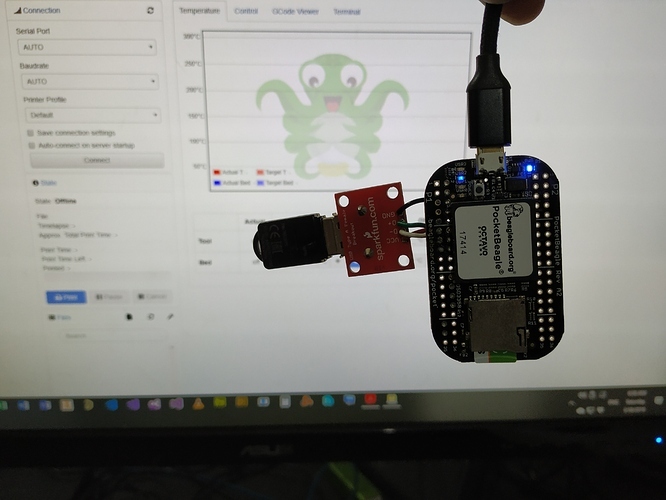 I expect Octoprint to perform about the same as it would on the RPI Zero. To that end what kind of problems/limitations should I expect to see? I know that video streaming is going to take a hit. Apart from that, what else? It doesn't need to be comprehensive, I just need to know what to expect as I develop my thing. How many cores does it have? You'd probably want to tweak it down to gpu_mem=64 since it only has 512MB RAM. Tweek the memory down to 64. Got it! If you're using Raspbian on that then it's unlikely that the drivers would take advantage of them. That's exactly right. 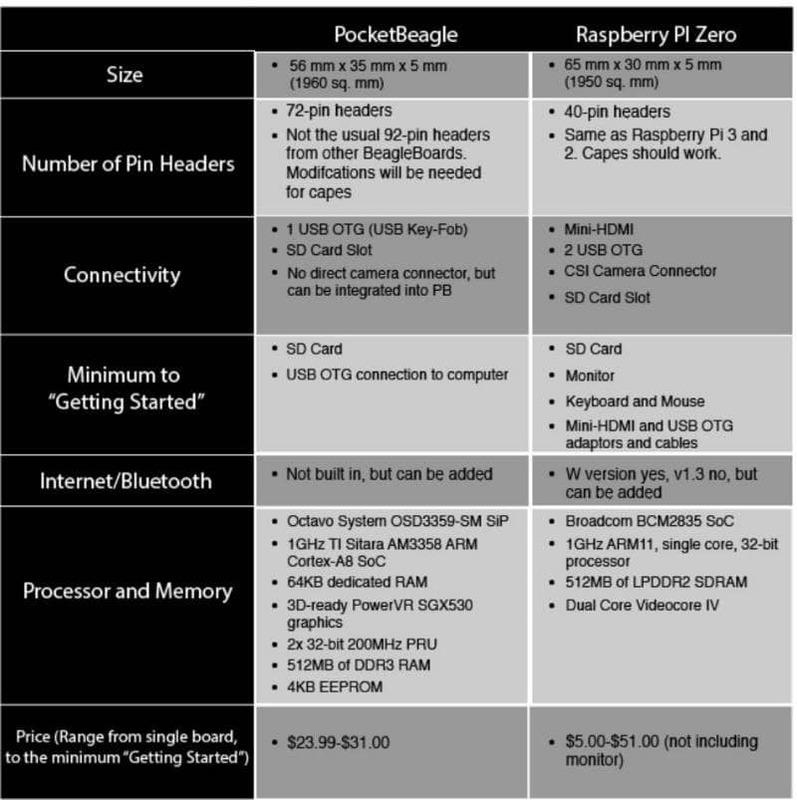 Imagine 200Mhz Arduinos with DMA access to main memory. I know replicape. Reedem though. I guess this is what I'm trying to do but for a different stepper chip that uses SPI to communicate (so no bit banging of the step pins). In case of a single core I'd be wary of on board webcam. CPU should in principle be fine. Will definitely be slower to start and reload and such than eg a pi3, and I also can't vouch for any third party plugins. A - you go x steps at y speed following L curve when I say "go"
B - you go z steps at w speed following Q curve when I say "go"
so, if you do it share .. So, I have that code already in c#. The line that you want to travel is a trapezoid. Each motor travels that distance as a percentage of the total which varies on the angle of the line. In the case of my SPI driver, chip select is active low. So when chip select goes high, it signals all the drivers to start their movement. That's how it stays in sync. Further, you can drive the internal logic via an external clock source, which would ensure that the calculations to generate the stepper pulses are in sync. You don't have to use it though, but it's there if you want. Already have working code to do it (for the L6470 stepper motor driver by ST Micro). The sharing part however, I haven't decided on. I just don't know if I should. So when chip select goes high, it signals all the drivers to start their movement. That's how it stays in sync. Further, you can drive the internal logic via an external clock source, which would ensure that the calculations to generate the stepper pulses are in sync. You don't have to use it though, but it's there if you want. Already have working code to do it (for the L6470 stepper motor driver by ST Micro). The sharing part however, I haven't decided on. I just don't know if I should. Humm... you make a very good point. Perhaps I have been selfish. Sigh, gpu_mem? It doesn't have a GPU. I thought that setting was to limit how much memory python would use. Is there is limiter for that?